Five years before the October, 1917 Bolshevik Revolution would begin to impose Communist totalitarianism on Russia, Henry C. Vedder, observed in his 1912 study of Socialism, that the Marxist Social Labor Federation of Britain had adopted Karl Marx’s “Das Kapital” [Capital] as their infallible authority, “an article of faith from which they will permit no dissent, on pain of excommunication.” Vedder, a Professor of Church History at the Upland, Pennsylvania Crozer Theological Seminary, added that this British Marxist organization rejected the orthodoxy of its own votaries unless they professed as their creed, “There is no God, and Karl Marx is his prophet” — mirroring the Islamic declaration of faith, or “shahada”. The late doyen of Islamic studies, Bernard Lewis, underscored how this summation of the Communist creed captured the “real affinity” between totalitarian Communism, and Islam, in a 1954 essay. 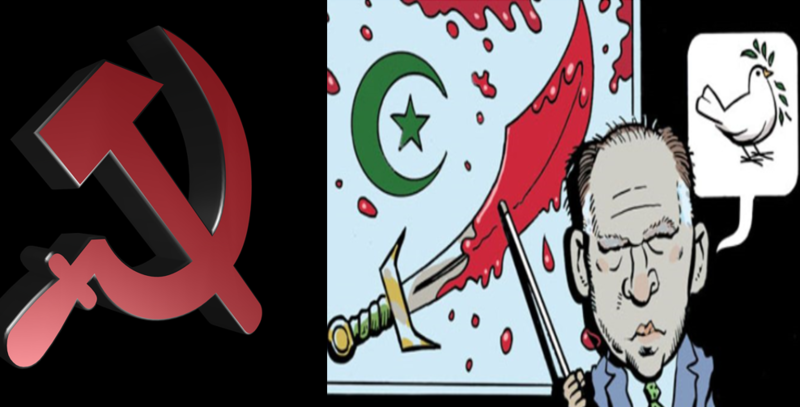 No one dominating our immediate attention deficit disordered news cycle better epitomizes this totalitarian ideological convergence of Communism and Islam than ex-CIA director, John Brennan. Can human rights violations in the Soviet Union be as easily justified in terms of the preservation of the communist ideology? Unfortunately (looking at events from a democratic perspective), yes. Since the absolute status of human rights has been denied, the justification for the violation of any of those rights has to be pursued from a particular ideological perspective. Leonid Brezhnev could justify human rights violations in the Soviet Union as a necessary part of the preservation of the communist ideological system. [W]ould the ability to demonstrate effectively increase human rights and democracy in Egypt? In the light of the political environment, probably not. At the present stage of political development in Egypt widespread open opposition to the administration would be beyond the capacity of the system to handle. Can the human rights violations in Egypt be justified from a democratic perspective? There can be no objective answer to this question because it depends on what one considers to be a threat to democracy in Egypt. Whether or not public demonstrations in Egypt actually threaten the existence of democracy in Egypt is uncertain. Ignoring Islam’s antithetical concept of freedom as hurriyya—perfect slavery to Allah’s Sharia—Brennan’s thesis also argued that freedom “cannot be labeled as a Western idea,” and “is very much a part of Islamic culture.” Hurriyya, “freedom,” is—as Ibn Arabi (d. 1240) the lionized “Greatest Sufi Master,” expressed it—“perfect slavery.” This conception, moreover, is not merely confined to the Sufis’ perhaps metaphorical understanding of the relationship between Allah the “master” and his human “slaves.” Following Islamic law (Sharia) slavishly throughout one’s life was paramount to hurriyya, “freedom.” This earlier more concrete characterization of hurriyya’s metaphysical meaning, whose essence Ibn Arabi reiterated, was pronounced by the Sufi scholar al-Qushayri (d. 1072/74). Let it be known to you that the real meaning of freedom lies in the perfection of slavery. If the slavery of a human being in relation to Allah is a true one, his freedom is relieved from the yoke of changes. Anyone who imagines that it may be granted to a human being to give up his slavery for a moment and disregard the commands and prohibitions of the religious law while possessing discretion and responsibility, has divested himself of Islam. Allah said to his Prophet: “Worship until certainty comes to you.” (Koran 15:99). As agreed upon by the [Koranic] commentators, “certainty” here means the end (of life). John Brennan’s useful idiocy for Stalinism and Sharia comports well with his central role in helping to orchestrate the manufactured “Trump-Russia collusion” faux narrative, which has evolved into a seditious, full-blown attempted putsch.